Miss the beginning? Start here. 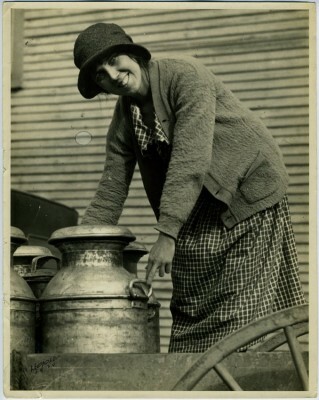 See now, my mother at that time she had a little milk store. And there was some in that neighborhood they used to come for milk and she would also sell butter…. I was in the fourth grade when my mother married a man that used to have a little farm…. On Johnnycake Road. And that was a little Jewish settlement, [Yaazor]…. Now my stepfather, he tried to make a living from the farm itself. He used to raise what he could, like tomatoes and corn. And he used to have a couple of cows. They used to make cream and cheese…. Now later on, when I got older…stepfather allowed me to have cows. And…my mother helped and I used to also make cream cheese and butter. I used to come in town and I had my customers,…. And then I had a cousin that had a store in the city, a little dry goods store and…I used to take care of that little store…. it was easier for her to have somebody to look after the store while she was…in the house, she didn’t have to run back and forth…. I bought a great big farm with a hundred and seventy acres [on Old Annapolis Road]. And…course I had people working for us…. That was a different farm altogether. That was a gentlemen’s farm…. And the men used to work on the farm. The women used to do the picking….. And…we farmed in nineteen-twenty, twenty-one, twenty-two. I think three years we farmed it…. I had a grocery store before I bought the farm. I had a grocery store on Monroe Street. That was during the war. And the troops came out, and I had the flu, I was very sick. A lot of people died. When I came out I just wanted to get out…and that’s how this farm was advertised. And we went and looked at it and we got together and we bought it. We didn’t have enough money, we had to borrow money, get mortgages on the farm…. we used to send loads of stuff in. To Marsh Market and they used to sell it…. Now when I bought the farm there was also a lot of cows. I’d also run the dairy then…we used to sell the milk [to]…Snesil Dairy…. And then we used to raise a lot of vegetables, like we used to have mules and big wagons, we used to send them in to the wholesale market….